My love of photography and Toronto has rewarded me. I love my city and I am constantly exploring it no matter the time or weather conditions. One very early morning on the way to work it must have been -27 this December morning and I saw a gingerbread “Toronto scape” presented by KitchenAid Canada. 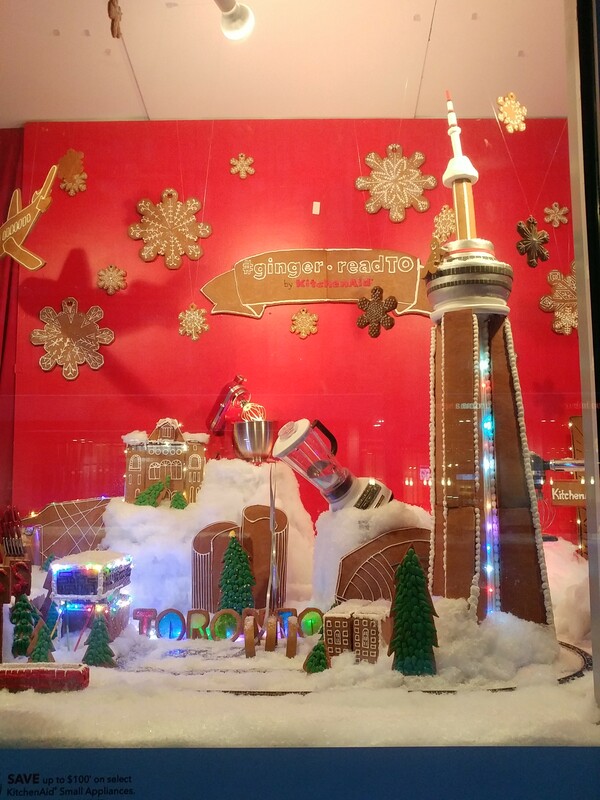 It was gingerbread pieces made by local bakery The Rolling Pin to resemble Toronto buildings. I took the picture, because that’s what I do and I used the hashtag made from gingerbread not knowing I had entered myself into a contest of sorts. Cut to me receiving a DM that I won a Professional 5 Series Mixer & Spiralizer and after answer a skill-testing question correctly these babies where shipped to me. 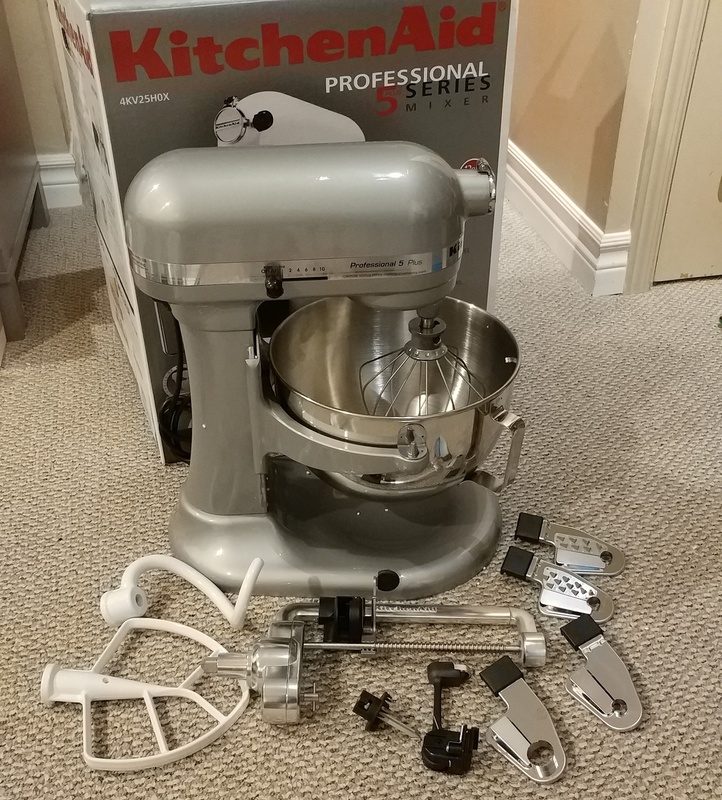 I can’t wait to give my new mixer a try as this one is bigger than my other KitchenAid Custom series mixer and I will not have to bake in batches anymore; which will save me time or I can start making multi flavoured layered cakes and mix at the same time. I was over the moon with excitement when I found out I won this awesome prize and I have many more recipes in mind for my new toys and also a request for apple pie using my gadgets. Cook Time: about 15 min. 1. In a medium size saucepan over medium heat warm olive oil. 2. Add onion and cloves and sauté until translucent. 3. 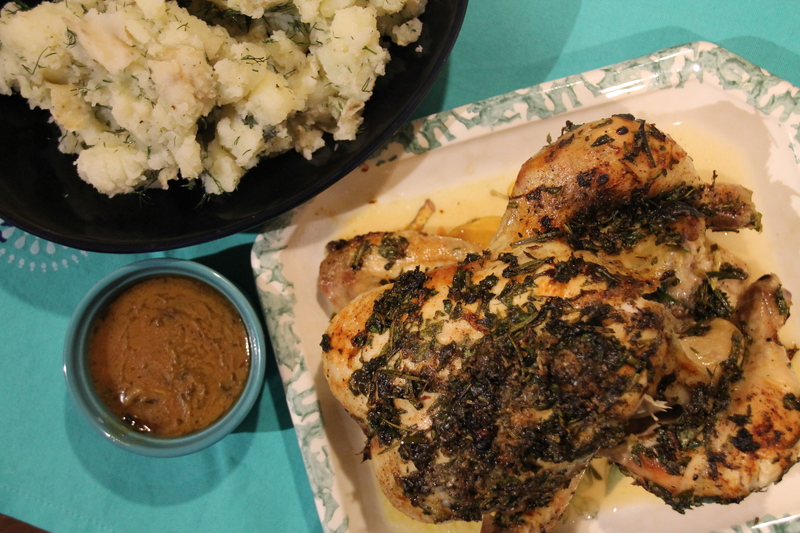 Season with herbs and spices. 4. Add green, red peppers, balsamic vinegar and add tomato sauce. 5. Let flavours merry and turn temperature to low heat to simmer. 1. Place ground turkey in a large bowl and add garlic, herbs, spices, Worcestershire sauce, red onion, bread crumbs, eggs and spiralized zucchini. 2. Combined and form into meatballs. 3. In a frying pan over medium-high heat warm extra virgin olive oil. 4. Sear meatballs on all sides in batches; about 1 minute per side. 5. Transfer meatballs to tomato sauce and simmer for 10 minutes. 6. Add zucchini to pan and cook for no more than 4 minutes. 7. Sprinkle with parmesan cheese and serve. 1. In a medium size saucepan over medium heat warm extra virgin olive oil. 4. Add green, red peppers, balsamic vinegar, tomato sauce and eggplant. 5. Let flavours merry and turn temperature to low heat. I was beyond excited to use my spiralizer and it couldn’t be any easier to use. 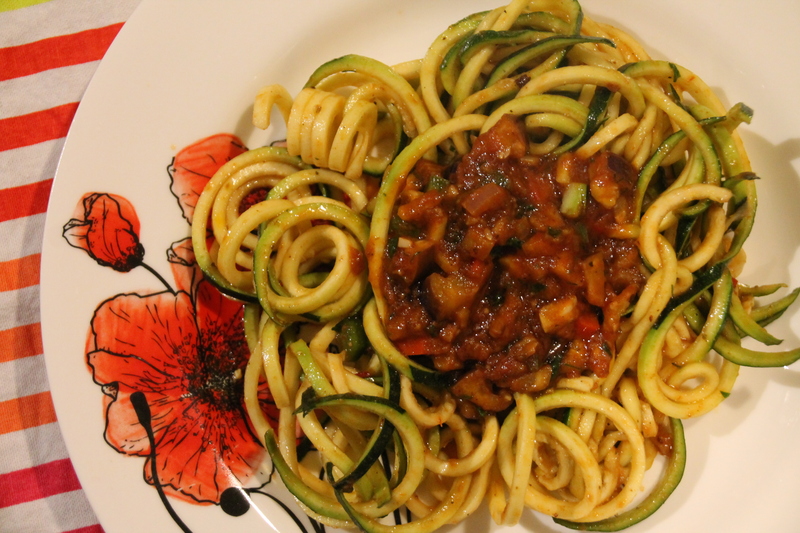 The zucchini was spiraled and crunchy and it makes a wonderful substitute if you don’t want to have carbohydrates. 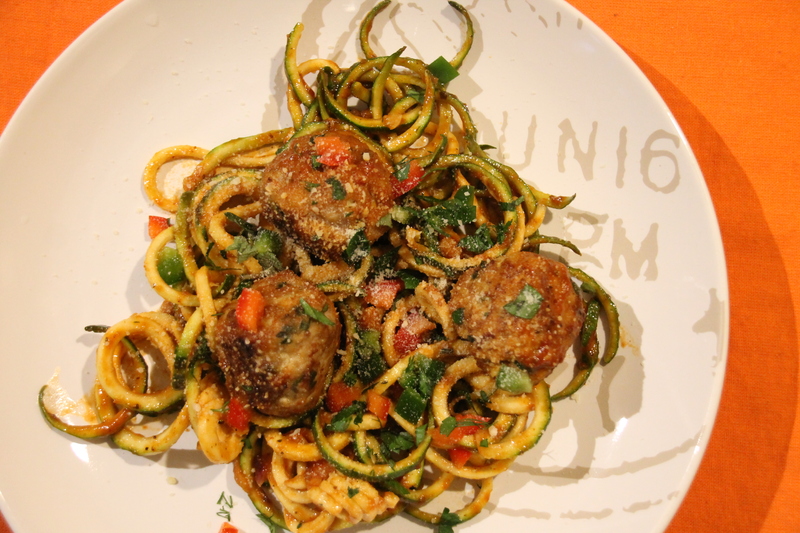 The turkey zucchini meatballs were so lovely that I think this will be a new way for me to enjoy meatballs. I will still make my Italian style meatballs; but this is now a healthier alternative for me. The eggplant ragu came about when I thought to take this recipe one step further and make a meatless vegan recipe. I have always been of the mindset that if I could prepare tasty and flavourful vegetarian and vegan recipes I could increase my meatless days to about three days a week and if I can make recipes like this it would be a no brainer. Also if you have an audience that you think would question the whole zucchini spaghetti, then serve the turkey meatballs with spaghetti pasta instead. These few recipes can be combined in different ways and it’s still just as memorable. Valentine’s Day is tomorrow and this is a recipe I have made many a time and for many different occasions and this is always a favourite. Cook Time: 30 – 35 min. 1. Preheat the oven to 350ºF. 2. Spray the pan with non-stick cooking spray. 3. In a large bowl, combine the melted butter with the sugar, cocoa powder, vanilla, food coloring and salt, stirring to combine. Then stir in the white vinegar. 4. Whisk together the eggs in a small bowl, and then stir them into the brownie batter. 5. Fold in the flour until just combined, then pour the batter into the prepared pan, reserving 1/3 of the batter for the topping. 6. In the bowl of a stand mixer (or using a handheld electric mixer), blend together the cream cheese, sugar, vanilla and egg yolk until well combined. 7. Spread the cream cheese mixture in an even layer over the brownie batter then top the cream cheese with dollops of the remaining brownie batter. 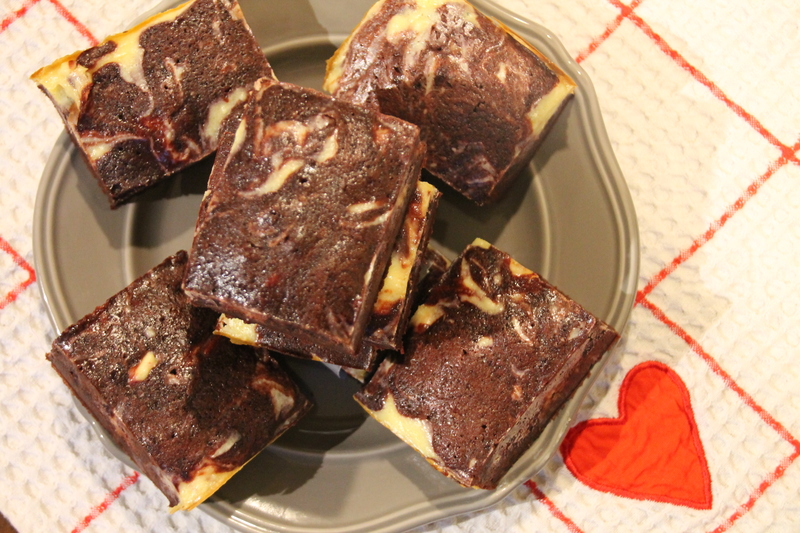 Using a sharp knife, swirl the cream cheese together with the dollops of brownie batter. 8. Bake the brownies for about 30 minutes. 9. Remove them from the oven and let them cool completely before lifting the parchment out of the pan then slicing and serving. 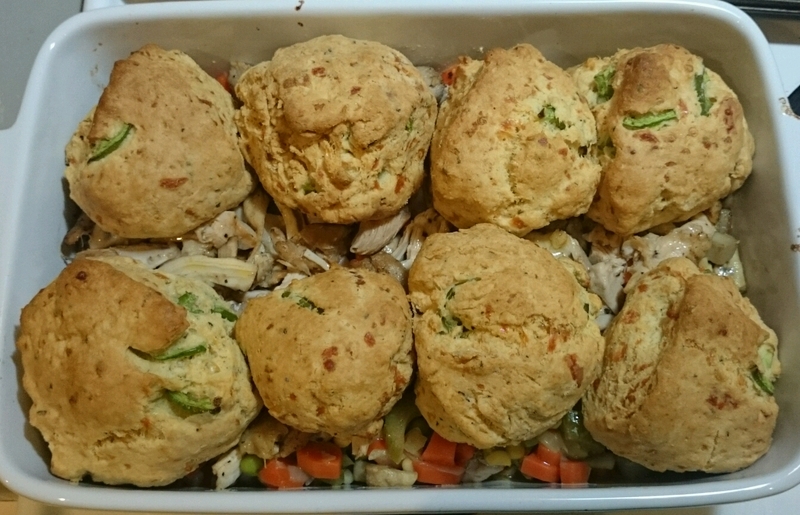 •	Serve with a scoop of French Vanilla Ice cream. •	Add more food colouring if you want the brownies to be redder. I don’t like to add to much dye to my baking so I held back here. •	I made these twice in a couple of weeks and found that the ones I baked in a glass Pyrex 9” x 9” dish came out more fudgey and moist than the ones I baked in a steel pan made for brownies specifically. (The ones with the grid make, so each slice is the perfect size). I prefer the Pyrex and suggest saving your money unless you got them on clearance like I did. This pan seemed to work much better for my blondies than brownies. Unless you prefer your brownies to be more dense. I not a fan of cheesecake, but this is the first cheesecake like recipe I could eat and say I enjoyed every bite. The mix of brownie and cream cheese lessened the “cheesecakey” taste. The brownie was dense and rich and decadent. All the taste testers loved it. I got told I’m running their diet; this is sooooo delicious; I’m taking one home for my BF; but he’ll be lucky if he actually get this and so one. Brownies to me is very subjective as to how you like to enjoy your brownie on the brownie spectrum.